Plot: A victim of a brutal attack finds a unique and beautiful therapeutic outlet to help him through his recovery process. Starring: Diane Kruger, Eiza GonzР“РЋlez, Steve Carell, Leslie Mann. distributed by Universal «Welcome to Marwen» in the US movie theaters released on December 21, 2018 and has grossed over $12 million worldwide; dvd and blu-ray release date was set for April 9, 2019. Rent from Netflix and Redbox from April 9, 2019. 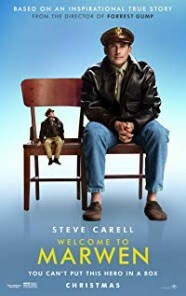 «Welcome to Marwen» in the UK released in movie theaters on January 1, 2019. DVD and blu-ray release date scheduled for May 13, 2019.